With swaying palm trees, sandy beaches and tropical breeze, Kerala’s narrow coastal strip, and layered landscape has made it one of the destinations to be at. Just a short distance away from the Arabian Sea, Kerala borders Tamil Nadu and Karnataka. With the Western Ghats as its backdrop, Kerala tourism thrives off its wildlife reserves, lush vegetation, aromatic spices, mountains and backwaters. Kerala is a solace place away from the bustle of India that highlights a slower way of life with an evocative history waiting to be told. Kerala has something to offer all year round. Nevertheless, the best time to go would be during the dry seasons from September to March. Kerala’s peak season offers a cooler climate and less rain, which makes exploring more comfortable. A trip to Kerala is not complete without exploring the unique sights and experiences that the region has to offer. 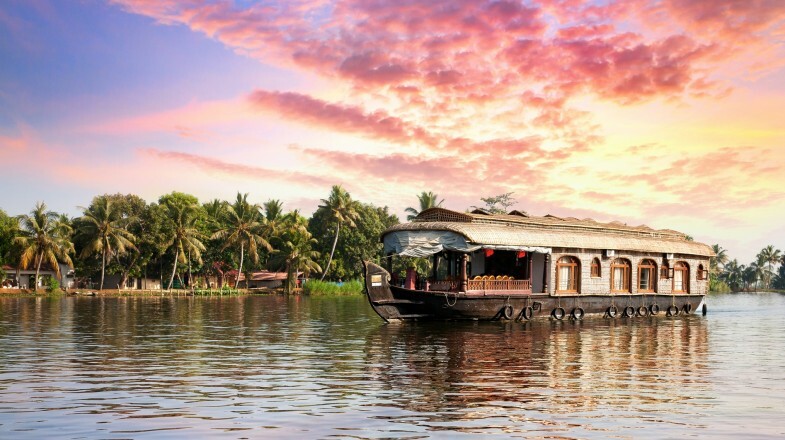 Take time and cruise the backwaters of Kerala where you’ll immerse yourself in the palm-lined waterways, wildlife, and villages floating among the coastlines. From there, discover the small, intricate villages that exist along the backwaters and connect with the local people and customs that give Kerala its distinct touch. If you’re up for it, enjoy a meal with a local family and hear about the stories of the many locals who have found life living off agriculture and fishing in the region. Explore the many areas that shape Kerala — including Kochi, Kannur, Kasaragod and Kollam. 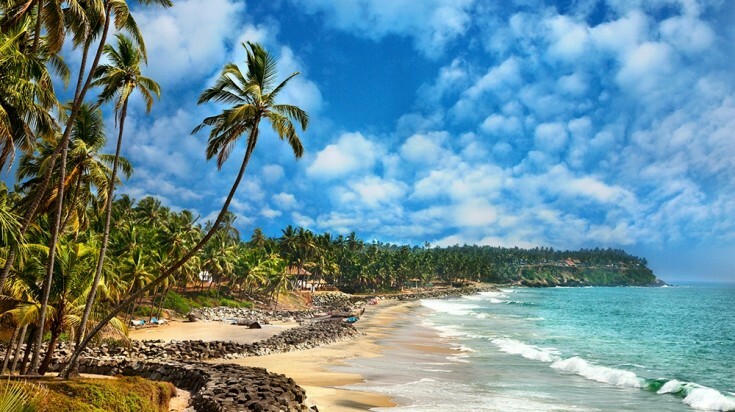 Be sure to spend some time at the gold-sand beaches such as Varkala and Kovalam to cap off your trip. More more information, read our article on places to visit in Kerala. 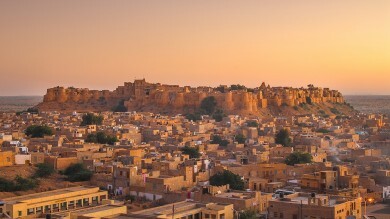 Discover the south of India with a 20-day tour exploring the vibrant temples, colonial hills, cascade mountains, tranquil waterways and historic palaces that were once capitals of the maharajas. 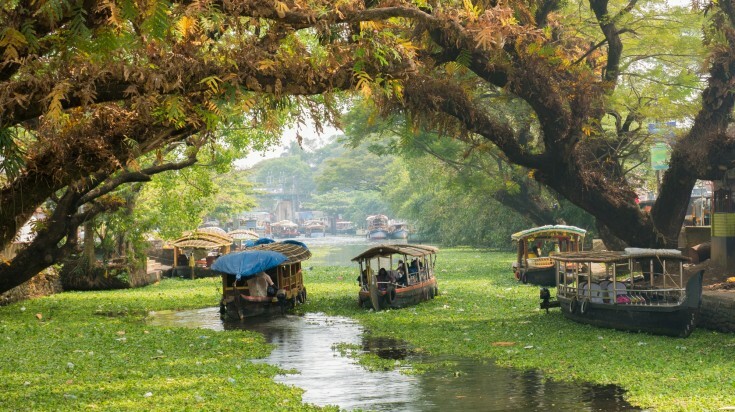 Beginning at Cochin, the former spice capital of India, the tour will take you through ancient spice ports, valleys, lagoons, islands and beaches that make southern India a gem of its own. End your adventures with a cruise of Kerala before returning to Cochin. This tour will enrich travelers with the diversity of South India and marvel at the historically rich region of the country. Go on an adventure and find waterfalls, tea plantations, and spice markets within the mountain ranges of India’s Western Ghats, a biodiverse region rich in resources and activity. 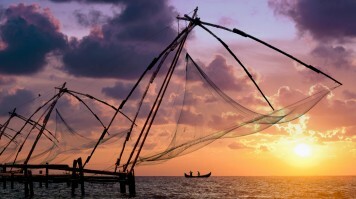 This 15-day tour will take you through Kochi and the inspiring fishing villages of the south where it’ll make way into tribal homes, bazaars and the cultural city of Mysore. You’ll learn more about spirituality, wildlife and the many animal sanctuaries that mark the south, while surrounded by the lush and tropical vegetation that makes it special. This tour will give travelers a more intimate experience with nature and leave them fascinated with the hidden jewels of India’s south. Venture through the south on this 14-day tour that takes you from Chennai to Kovalam where you’ll embark on an adventure of India’s southern charm and hospitality. From green mountains to golden beaches to the quaint fishing villages and rural towns, this tour will take you into the heart of Kerala’s people. Experience the culture, religion, and history of the region with a mix of idyllic and contemporary life and the stillness of its everyday people. If you desire a tour that’ll take you on the road less traveled. This is it. Be a tourist for a day and fix yourself on all the best South India has to offer. 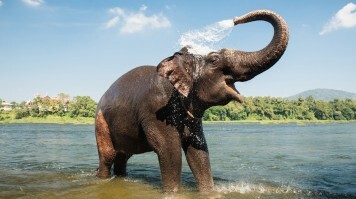 This 13-day tour will take you on an elephant ride in Mysore, followed by a view of the many tea plantations in Munnar, watch a traditional Kathakali dance show in Cochin and whisk away on a wildlife safari ride. 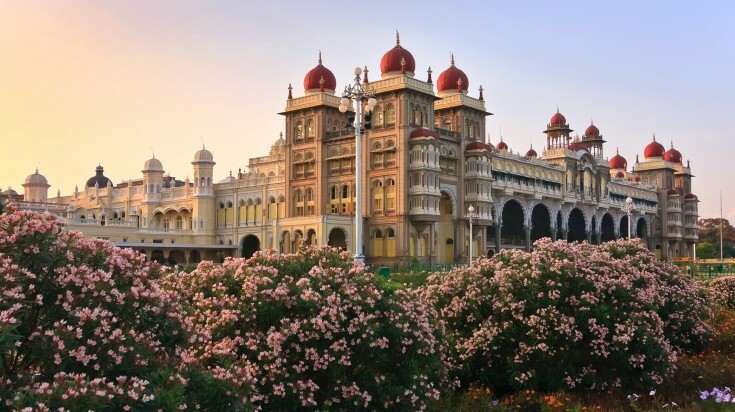 From Mysore, to Munnar, Cochin and Bangalore, tour the hotspots each city has to offer and find charm in the local markets, botanical gardens, shopping hubs and wonders that are off the guide map. Close your adventures off with a scenic tour of the greatest sights of India’s south that’ll leave you wanting for more. Day 1: Spend time in the tea-growing region of Kerala. At Kochi, you’ll explore the many emerald green plantations that line the fields and get an opportunity to brew your own tea for a try. After learning about tea and its importance to the Indian culture, join a Kalaripayattu show. Founded in Kerala, the ancient martial art is pride to those of the region. Watch a show and learn how the ancient arts connect to the history of the region. Day 2: Find out more about tea when you head to the Idukki District in Munnar. Invest some time in the tea museum that’ll teach you about the many aspects of tea preservation and the history of the plantations in the Western Ghats. Then visit the spice plantations of Kerala, where you’ll get to discover the many spices cultivated in the region and learn about the rich history behind each one. Day 3: Make a pit stop at Thekkady and spend a day at Periyar National Park. This is where you’ll make friends with elephants, muntjacs, barking deer and Periyar tigers. Take a hike around the many hills and mountains that shape the region as well as spend time educating yourself on the flora and fauna that fill the area. End your day watching a Kathakali show, a popular Indian classical dance — a definite do-not-miss. Day 4: After exploring the sanctuary and wildlife reserves, rewind on the beaches in Varkala. Spend some time exploring the coast of Varkala, where among the cliffs you can catch some breathtaking views of Kerala. Relax on the numerous water spouts and spas that can be found resting on these cliffs. Then, from a full day of exploration, spend time on Varkala Beach sunbathing and swimming to your heart's content. Don’t forget to stay for the ultimate sunset! Day 5: Finish off your tour cruising the many backwaters that give Kerala its worldwide name. Find your way to Alleppey, also known as the “Venice of the East” and soak in the mesmerizing and captivating Kerala backwaters. Alleppey is home to a huge network that connects the many backwaters in the region. Go on a houseboat and enjoy a cruise along the Vembanad Lake where you can catch floating villages and make friends with locals along the way. Temples hold strict dress codes for visitors. Make sure to dress conservatively and bring a scarf to cover up if needed. Footwear is banned upon entering the temple. Food in Kerala is on the spicy side. It may take time to adjust. If spicy isn’t something you can handle, make sure to inquire to see if the spice levels can be adjusted to fit your taste. Tipping is expected in Kerala. 10% is considered the usual standard to follow. Ayurveda treatments are widely available. However, be careful and go to only the Ayurveda centers approved by the Kerala Tourism Department. Tickets to sightseeing spots are reserved on a first come first served basis. So, make sure to order online or give yourself enough time when looking to book. Kerala also has separate lines for foreigners in most sightseeing attractions. Unlike the epicenters of Delhi or Jaipur, Kerala brings a more distinct, slower way of life from the rest of India. 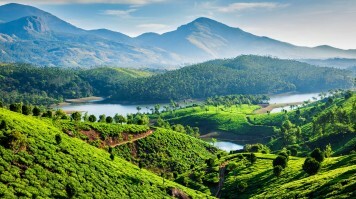 Kerala’s dramatic diversity with tropical beaches, lakes and towering hills bring a distinct appeal that cannot be found anywhere else in India. Kerala’s tourism centers around the region’s calmer lifestyle and a more intentional way of life that have attracted travelers from all as a destination to retreat and be still. So, set intention today and go on a Kerala tour now.